A little while ago, there was an award winning Danish political series (with a murder), and “everybody” was praising it for being genius. Since I like a little suspense, and am one of the two people who depends on tv for drama instead of downloading it, I tried watching it when after long anticipation it finally aired in The Netherlands. And halfway three I gave up and complained with my mother that this series was absolutely boring and that I couldnt t understand what the fuss was about. What I did with Borgen was the same mistake a lot of us make when picking a movie, buying a car, selecting a partner or starting some form of physical exercise for no reason other than that EVERYBODY says that Borgen is the best series of the year; that a car will provide you with a sense of freedom; your partner should be reliable and yoga will get you slim and toned. And yoga only works to the extend to which you fall in love with it. As will any form of exercise, for that matter. Once somebody is enthusiastic or adamant about something, we think that it is our cue to start doing the same thing. It’s not. Not unless you share the same likes and dislikes as that person, similar talents or characteristics, the same fears or the same ambitions. And even then you re probably better off investigating inward, before you jump to action. For 15 weeks I m working with Sadie Nardini’s Core Strength Vinyasa Yoga. Which stresses that you should not jump, just because other yogis have been doing that for decades. That you should not work towards a certain pose because wise men in India say it’s done that way. Not good enough reasons. Sadie builds the pose from the ground up, using the deep core line. The deep core line runs from your feet to your tongue, and includes the psoas. The psoas runs from the upper back of your inner thigh bone, wraps forward over the hips, to the back behind the abdominal organs, attached to the low spine, ultimately connecting with the muscles from the diaphragm. If you’re all tensed up the psoas is the muscle that pulls your body into a fetal position. If you’re interested in the anatomy of psoas and the deep core line you can watch this (graphic dissecting body parts) video here, and study the work of Tom Myers. The deep core line is like the energetic highway of energy through your body, and this line is designed to hold you up. But it can only do so if you activate it from the ground up. If you just pull your navel in, thinking you’re doing something with “your core” you’re probably just using your superficial body = in this case your abdominal muscles. But if you exhale pushing your feet into the floor and from there kind of zip the back of the spine up, that’s core line. The foundation of the pose is your connection to the earth, firing the deep core line, which then builds up (exhaling) energy through the legs into your core and then you express/ extend the arms/ back bend a little (opening your heart). So she uses the exhale whenever you come up. And then the inhale is to kind of “fill the pose”/ extend your arms/ bend a little. The inhale is reserved for that final last bit of your movement or “doing” the pose: expressing. And you just see how far it goes. Contrary to other lineages of yoga, Sadie is very concerned about you opening your heart (back bending) too much, and especially worried about you doing it without staying connected to your core. So that’s the physical part of doing yoga from the core. On a mental part that Sadie translates her lessons to be weary of expressing/ giving what other people want from you. Stay in your own integrity. Are you firmly rooted, hence are you in any position to give right now? And what is at your core? And how can you ignite your core beliefs, and build up that mental energy, to a place from where you can express in your own unique way? Always check your foundation first and work from your own unique values. Don’t sacrifice what’s holding you up, don’t cut corners on what’s making you tick, and never ever mess with what’s keeping you rooted. For 15 weeks I’m teaching based on classes from Sadie Nardini. This week I m using the classes we did in the first two weeks of October, and created this month’s pdf’s for home practice. I considered using this month’s (still unused) “Good Girl” Madonna soundtrack, but after this blogpost I suspect it will be all the more powerful if I just stick with what I really want. 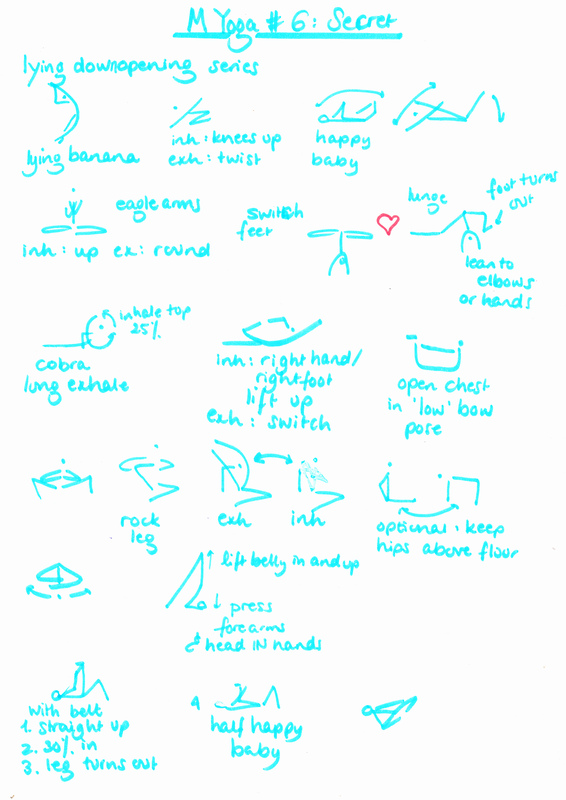 This entry was posted in Personal, Rockstar Yoga and tagged home yoga, Sadie Nardini. Bookmark the permalink.